From L To R: Mr. Akbar Ebrahim, leading Indian formula 1 trainer, Rtn. Jayanthi Govindan, President, RCM East, Yash Aradhya, Yamini Prashant, Rtn. C R Raju, District Governor, R I District 3230, and Rtn. Babu Krishnamoorthy, Secretary, RCM East. 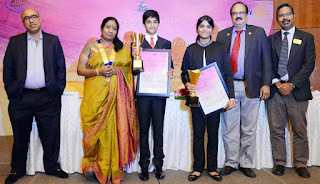 The Rotary Club of Madras East, one of the premium Clubs in Chennai, presented the Young Achiever Award to two talented Children: Yamini Prashant (14 yr old) for Literature and Yash Aradhya (13 yr old) for Motor Sport. The Chief Guest was Mr. Akbar Ebrahim, leading formula 1 trainer in India and the Guest of Honour was District Governor Rtn. C R Raju, R I District 3230. Rtn. Jayanthi Govindan, President and Rtn. Babu Krishnamoorthy, Secretary, RCM East were present.